By the time I went to bed around 11 p.m., the service still was not back up. It was back this morning when I woke up, though, so they did get it fixed sometime overnight. Still, though, the outage lasted for at least 8 hours, possibly quite a bit longer. During this outage, the only access I had to the outside world (the Internet) was through my wife’s Blackberry. I stole it away from her on occasion to check Twitter, but that was about all I was able to do. The thing that bothers me the most about this issue is not the fact that it happened, but that Virgin Mobile seems to have been so quiet about it. After seeing a few other people on Twitter talk about the issue, it seems that the “try again in [2 or 4] hours” was simply a company line that basically translated to “we don’t know what’s going on or when it will be fixed”. 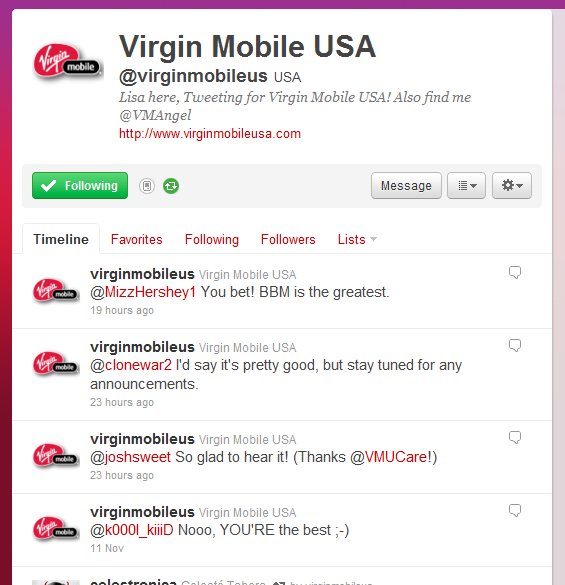 The official @virginmobileus Twitter stream was completely and totally quiet throughout the outage, as well; almost as though they couldn’t access the Internet, either. Were you affected by the outage? I know that, at the very least, many people on the east coast were affected. I’m curious how far this outage spread. It also seems that Sprint devices were unaffected by the outage. Therefore, even though the Broadband2Go system works on the Sprint network, it must have been localized specifically to the Virgin Mobile users. Of course, if I still had my iPhone, I would have been able to blog about this while it was happening. The good news is, my Windows Phone is scheduled to be delivered today, so hopefully I won’t be quite so cut-off from the world if this ever happens again. phones pretty quickly except when they have an outage. i waited on the phone for 13 minutes yesterday but when i called a couple weeks ago during an outagage, i was on hold for 45 minutes. i called back the next day and asked what they were going to do for me because i was still paying during the outage. they said they would give me a dollar… i took it. I totally agree. The exact same thing happened to me. 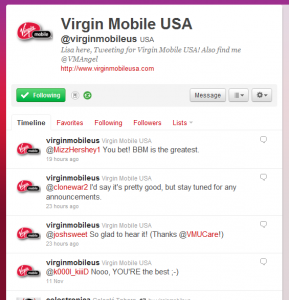 Actually virgin mobile had an outage on the 11th as well. They were down for at least 5 or 6 hours then as well. Calling them produced a tech who said to try back in a few hours. By the morning it was back up but it was down again on the 12th. There was (and still has been) absolutely no official announcement from them about even the fact that this happened at all. What really got me angry was that on the 12th when I got ahold of a tech rep I was told that this was an “upgrade”. First of all I think that’s a lie. This was an unplanned outage. Second, if it was planned then why in the hell didn’t they at least inform their customers that they would be down? I am seriosly considering dropping them after this. interesting – will have to ask my mother when I see her later today – she has been using a Virgin Mobile cell for years now – it’s been great – she even tops up on her own now! Sprint Was The Reason Of The Problem. Many Sprint Customers Complained Last Night About An Outage And About Their Calling Or Texting Not Working. Seems A Little Backwards To Me. A lot of kids (teens) who have to pay for their own phones use Virgin mobile, I can only imagine how many of them were upset about the outage, not being able to make texts and calls. Hopefully Virgin will take precautions so this doesn’t happen again. i did not have a problen with my virgin mobile phone, only the virgin mobile mifi box. my service on my phone was out since last Wed. or Thursday… no net… no account info access.. and couldn’t send any pic graphics from my phone. Went to Radio Shack and they said they weren’t aware of any outage… to call Virgin Mobile. I have not been able to get on the Internet with my phone since I reinstated my monthly pack on November 11th! When I contacted Virgin Mobile in November they were very rude and basically told me to keep my pants on because there was an outage. An outage I was not made aware of!